Fluorosis, which causes dental and skeletal decay, is endemic in at least 25 countries across the world. According to estimates by Fluoride Action Network, a US-based non-profit, 25 million people are affected by fluorosis in India and another 66 million are at a risk. It’s simple. 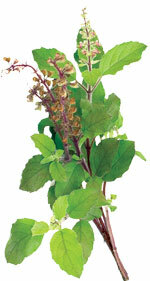 All one needs to do is either boil or shake a handful of holy basil or tulsi leaves with water for a while. This is enough to decontaminate about 20 litres of water. To test the efficacy of the method, we experimented with various water samples having different fluoride concentrations. When 75 mg of fresh leaves were added to 100 ml of water with a fluoride concentration of 5 ppm, nearly 95 per cent fluoride was removed in 20 minutes. Stems and dried leaves had a fluoride removal efficiency of 74 to 78 per cent for the same water sample. During a study in 2009, I found that 24 per cent of water samples from Rajura tehsil in Chandrapur district have fluoride concentration higher than the permissible limit. Most fluorosis victims here were poor. This prompted me to work towards finding a fluoride removal method that is accessible even to those having little money. I thought a locally available plant is the best option. Due to their proven medicinal properties, tulsi leaves have been used since ages to consecrate drinking water during festivals. I decided to experiment with the plant and see if it can remove fluoride from water. We presented the study at the Indian Science Congress in January this year. Now we plan to carry out the experiment on a larger scale. The method is safe and certainly better than drinking untreated water but more studies are still needed to find out how tulsi leaves absorb fluoride. Yes it is a fact that tulsi leaves are very healthy and that may be the reason for its extensive use in our religious ceremonies. I have also read somewhere that if one eat one tulsi leaf daily , he or she may not suffer from the dreaded ailment like Cancer. Yes we do to carry out more and more experiments to prove it.